What’s a salad without dressing? Not very good. Considering that most stores bought salad dressings are inorganic and filled with unhealthy elements, (like canola oil) what are you going to do? Make your own great tasting healthy dressing, of course! Here’s a zesty recipe for a popular winner. Fresh – Rosemary, Basil, Oregano, Thyme, and other favorite herbs in generous measure. Put all ingredients in a blender and puree! Put together in a blender and blend at medium speed for only 5 or so seconds. Save extra vinegar dressing in refrigerator to use with further oil dressings later. Lay a thick bed of “Spring Mix” salad greens in a large mixing bowl. Top with one mound of fresh, shredded carrots and one mound of fresh, shredded beets. This is the main body of the salad. You can vary the toppings each day, so you won’t get bored. One day you can use tomatoes, cucumber, and celery. Another day avocado, onion, and sliced radishes. Another day, apples, raisins, and sprouts, or how about Greek olives, or an organic nut mix! The point is that you ALWAYS use the main ingredients and vary the toppings. Everything should be organic, but it’s not absolutely essential. After you’ve made the salad, sprinkle a generous amount of the Vital Nutrition Plus on top (1 -2 tablespoons or more). Then put a moderate amount of the oil/vinegar dressing on top of the Vital Nutrition Plus, so as to saturate the Vital Nutrition Plus powder and a little extra to barely moisten the salad ingredients. You don’t want so much that a pond forms at the bottom of the bowl. Mix it all together. 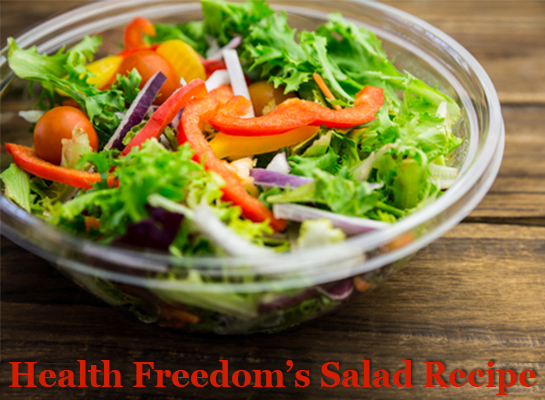 Here is what is so special about the Health Freedom Salad: It is truly a complete meal! It has enough oil, carbohydrates, and protein. 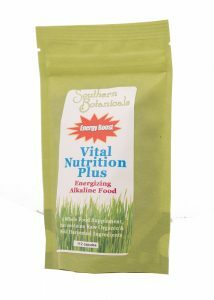 In addition, the medley of ingredients are loaded with minerals and natural enzymes – from fresh garlic, ginger, salad fixings, and olive oil, plus Vital Nutrition Plus and Apple Cider Vinegar. Great for balancing the body’s PH, as well. Eat a large Health Freedom’s salad every day. Bon Appetite!